Impacted wisdom teeth management in Kingston, London. Open 7 days. 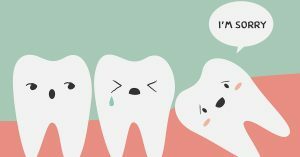 Many patients suffer from impacted wisdom teeth. However some impacted wisdom teeth do not cause any symptoms. Often due to overcrowding, the wisdom teeth can erupt horizontally, angled inwards, outwards or backwards. This can cause food and plaque to gather around the wisdom teeth gum which can lead to tooth decay or recurrent gum infection. Due to the difficulty in reaching wisdom teeth during regular brushing, theses teeth are susceptible to bacterial infection. If there are no signs or symptoms associated with the impacted wisdom tooth, then usually no treatment is necessary and the tooth can be monitored. If signs and symptoms exist then the type of procedure required varies from case to case. Sometimes it can just be a simple surgical procedure to remove the wisdom tooth. Where the wisdom tooth is very close to the neighbouring nerve tissue, coronectomy is usually the best treatment. For very difficult wisdom teeth removals, patients will be referred to our oral surgeon who is based at Pearl Dental Clinic. Wisdom teeth are usually removed under local anaesthetic with or without IV sedation. After the procedure, some swelling and tenderness may be experienced in the region of the tooth extraction and we recommend a few days of rest after impacted wisdom tooth extractions. At Pearl Dental Clinic, our private Wisdom Tooth Extraction service is available 365 days a year, 7 days a week from 9am-10pm, both to patients registered with the practice and to new patients. We provide same-day tooth extractions, even for complex wisdom teeth extractions. Other dental practices routinely refer patients who require urgent complex tooth extractions to our clinic for treatment. You can book dental appointments online 24 hours a day and if necessary have a wisdom tooth removed on the same day.